Quote: ...Got it working--I had put the files in the 'lib' directory for the application, instead of the runtime. Maybe the extra files will go when the Gimp flatpak updates (perhaps 2.10.2), which I think might be sooner rather than later. You might have to slip them in again. Not a big problem. I do not know how often the org.gnome.Platform runtime updates, if ever, it will be nice if it does. found it in /lib/x86_64-linux-gnu as a link to libpcre.so.3.13.2. Failed to load module "gtk-vector-screenshot"
That module is installed in my system, so I wonder what it really misses and how to solve that. Ah..a Mint installation Thanks for the information. Yes, never got round to adding libpcre.so.3 to the zip of files. Done that now and included the BIMP plugin and nufraw as a separate zip. Nufraw should only be be used if you need it. It will disable loading SVG files, do not know why, in the code somewhere. Most of those warnings have been there all through the Gimp 2.9.x development versions. Still there. I do not know about that Failed to load module "gtk-vector-screenshot"
The screenshot File -> Create -> ScreenShot never worked for me in Gimp 2.9.x but there even better in Gimp 2.10 - amazing. Ignore most of those warnings in the screenshots, I use an ancient theme and I always disable recently-used.xbel Hate that long list of filenames. The flatpak keeps the recently-used.xbel file in ~/.var/app/org.gimp.GIMP/data/ so you can always delete it when required. Also a ever increasing folder of image thumbnails - delete as well. With the Installation it created the launcher in the Mint Menue. 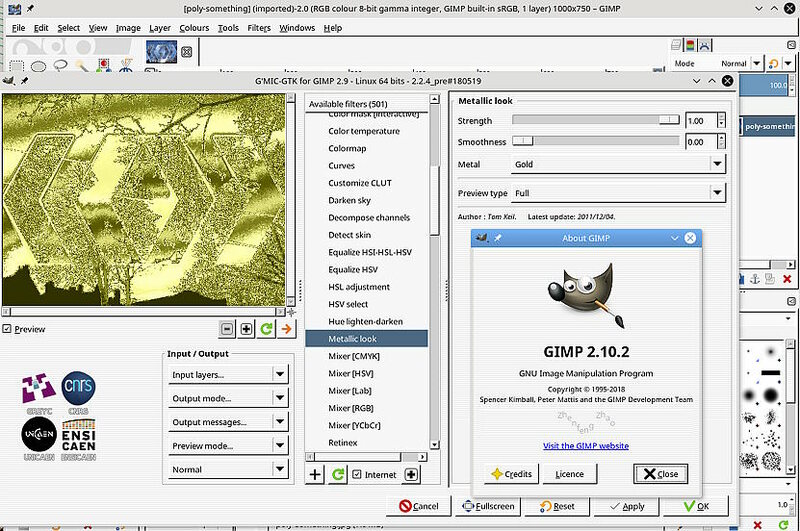 Also it created system integration ... so when I now click on "open with GIMP" it's Gimp 2.10 which opens, not 2.8. I launched it via terminal to catch any error messages concerning BIMP. Would have missed it if it couldn't start. I got the flatpak working, but I cannot get the resynthesizer nor the Gmic plugins working. I was thinking that the only major difference between this and the 2.9.9 version that Rich posted is the ability to have masks on layer groups. I think I can deal with 2.9.9 for now. 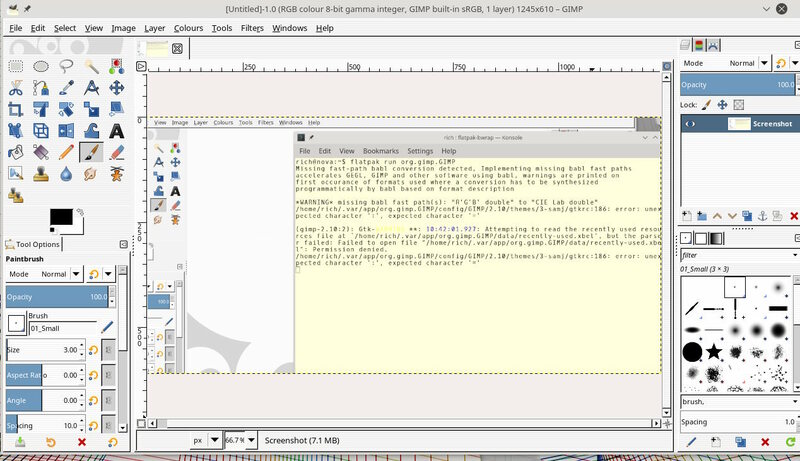 At some point I hope that Linux Mint updates Gimp in the repositories. 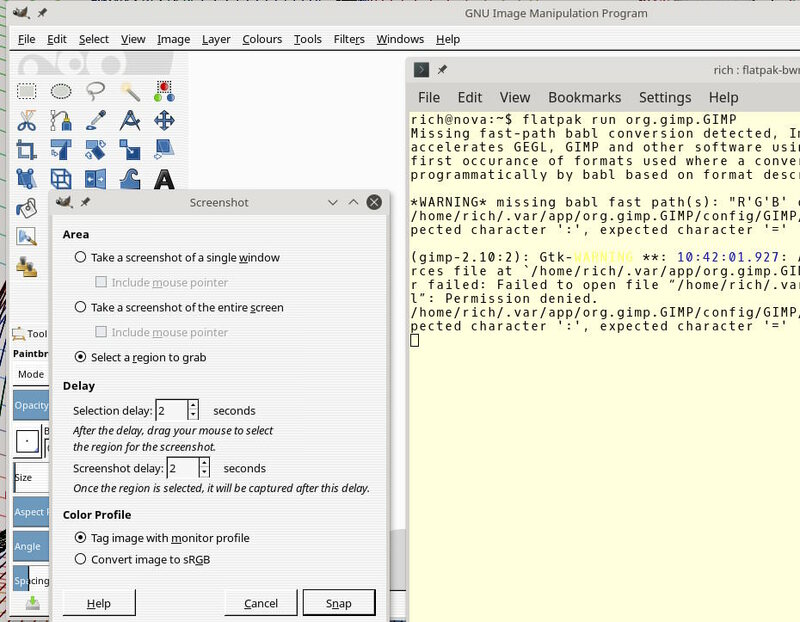 Gimp 2.10.2 is out, including the flatpak. Needed to re-side-load libfiles to get some plugins working including the last of the GTK gmic's. Still no QT support, I know it not the Gimp part of the flatpak but still annoying.